Cavanaugh, Catherine. "Famous Five". The Canadian Encyclopedia, 25 August 2017, Historica Canada. https://www.thecanadianencyclopedia.ca/en/article/famous-5. Accessed 20 April 2019. Alberta's "Famous Five" were petitioners in the groundbreaking Persons Case, a case brought before the Supreme Court of Canada in 1927 and later decided by the Judicial Council of Britain's Privy Council (1929), Canada's highest court at the time. Led by judge Emily Murphy, the group included Henrietta Muir Edwards, Nellie McClung, Louise Crummy McKinney and Irene Parlby. Together, the five women had many years of active work in various campaigns for women's rights dating back to the 1880s and 90s and they enjoyed a national and, especially in the case of McClung, an international reputation among reformers. At the time of their victory, the media dubbed the group the "Alberta Five." Over time, as the case took on a privileged position in Canadian women's history, the group became popularly known as the "Famous Five." They have come to represent an entire generation's political activism, including an earlier, nationwide campaign for women's suffrage. More recently, the case has attracted renewed controversy. Some see the Famous Five as a symbol of modernity, women's political rebellion and progress, and human rights more generally. Still others have criticized some members of the group as racist and elitist and see their accomplishments as tarnished by associations with the eugenics movement. 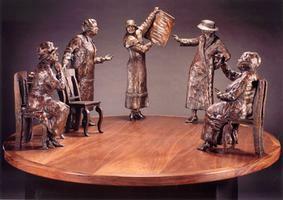 Reactions to the Famous Five have varied widely, but the significance of their contribution to the development of women's rights in Canada was underscored in 2000 with the dedication of a bronze statue called "Women Are Persons!" by Edmonton artist Barbara Paterson in Ottawa and Calgary (1999). The Famous 5 Foundation was established in 1996. Catherine Cavanaugh, "Out of the West: History, Memory and the Persons Case, 1919-2000," in Forging Alberta's Constitutional Framework, 1670-2005, Richard Connors and John Law, eds (2005); Nancy Millar, The Famous Five (1999). Nellie McClungView a Heritage Minute devoted to Nellie McClung. From Historica Canada.